John Ferguson Weir (1841-1926), Basilica of San Francesco d'Assisi, Italy (1902), oil on canvas, 63.5 x 76.8 cm, Private collection. Wikimedia Commons. You will already have come across the wonderful paintings of the American Impressionist Julian Alden Weir (1852-1919), which I sampled in my article about him. He came from a very artistic family: his father, Robert Walter Weir, was a professor of drawing at West Point, and his half-brother John Ferguson Weir (1841-1926) was almost as well-known as a painter, also a sculptor and an influential educator. More than ten years older than Julian Alden Weir, John Ferguson Weir trained at West Point, New York, and at the National Academy. This was briefly interrupted in 1861 when he served in the US Civil War. He received his first commission in 1862, when he was only 21, and set up his studio in the Tenth Street Studio, New York. 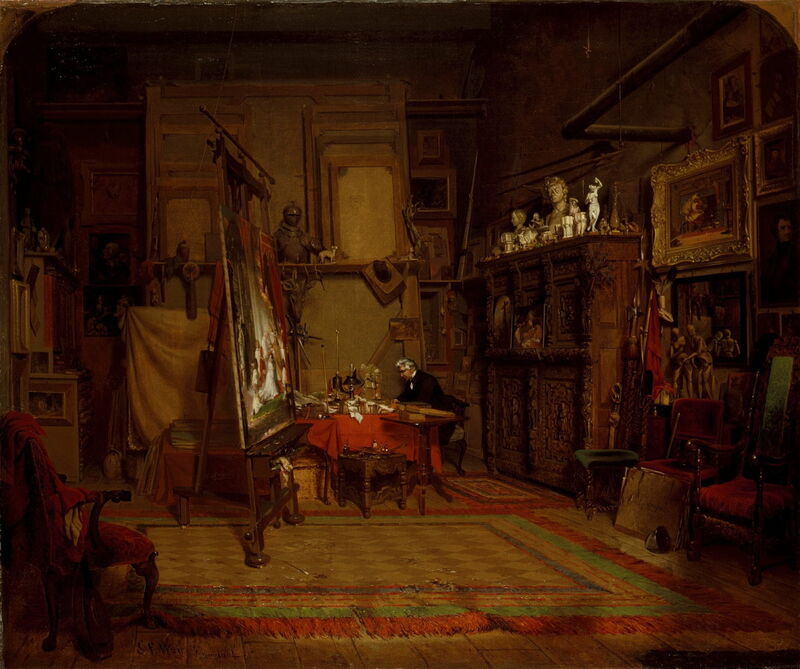 John Ferguson Weir (1841-1926), An Artist’s Studio (1864), oil on canvas, 64.8 x 77.5 cm, Los Angeles County Museum of Art, Los Angeles, CA. Courtesy of Los Angeles County Museum of Art, via Wikimedia Commons. His first major work (after that commission) was An Artist’s Studio (1864), in which the artist in question is his father, not himself. To his delight it was exhibited, sold, and brought his election as an associate of the National Academy. 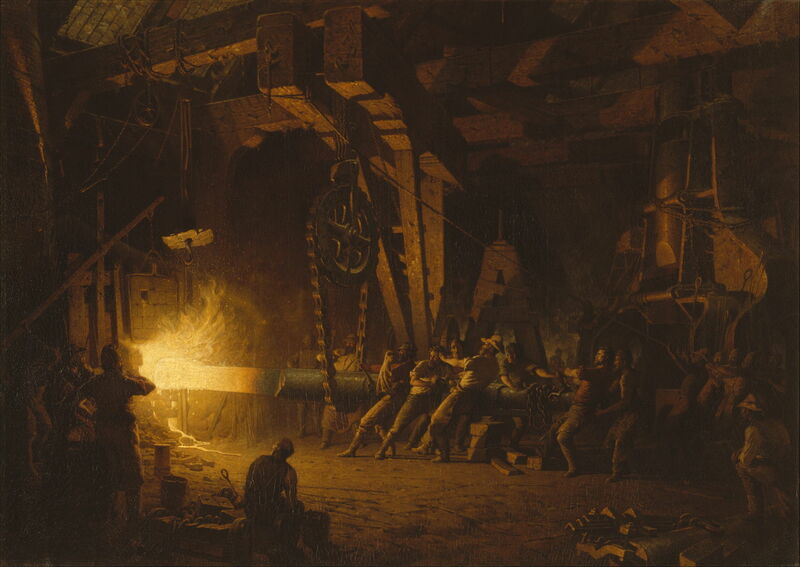 He next took his rather dark realism before an unusual motif for American painting at that time – the hot, harsh, and dangerous world of the West Point Iron and Cannon Factory, in his The Gun Foundry (1866). The moment shown is the casting of a Parrott Gun, in the foundry responsible for making most of the large guns used by the Union forces during the Civil War. 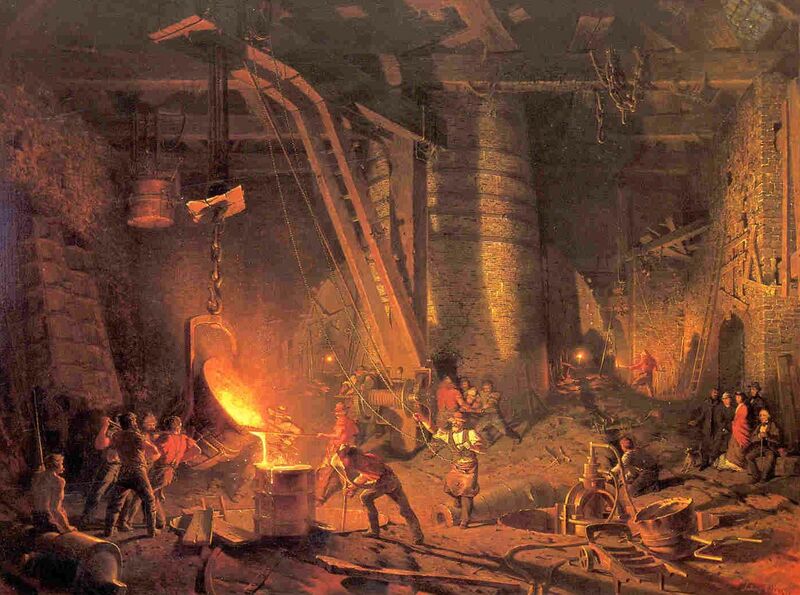 This is similar to the earlier works of Joseph Wright of Derby, de Loutherbourg, and others who had painted the Industrial Revolution in Europe during the late 1700s. This led to his election as a full Academician. His Forging the Shaft is a replica which he painted in 1874-7, after the original of 1868 was destroyed in a fire at a New York gallery. It shows the same foundry, this time working the massive propellor shaft for an ocean liner, more a symbol of peace and trade than past conflict. The success of the original painting led to the offer to become Professor and the first Director of the School of Fine Arts at Yale University, which he accepted. Seizing the opportunity before he started at Yale, in late 1868 Weir set out for Europe, where he travelled from Paris to Italy, Switzerland, Germany, the Netherlands, and Belgium. He produced a remarkable series of landscapes showing many of the places that he visited – a series which compares with any of JMW Turner’s, although Weir generally kept to his detailed realism. John Ferguson Weir (1841-1926), Lago Maggiore, Italy (1869), oil on paper, 20.3 x 33 cm, Private collection. Wikimedia Commons. Lago Maggiore, Italy (1869) appears to have been painted en plein air on 31 May 1869, during his return journey from Italy towards Switzerland. 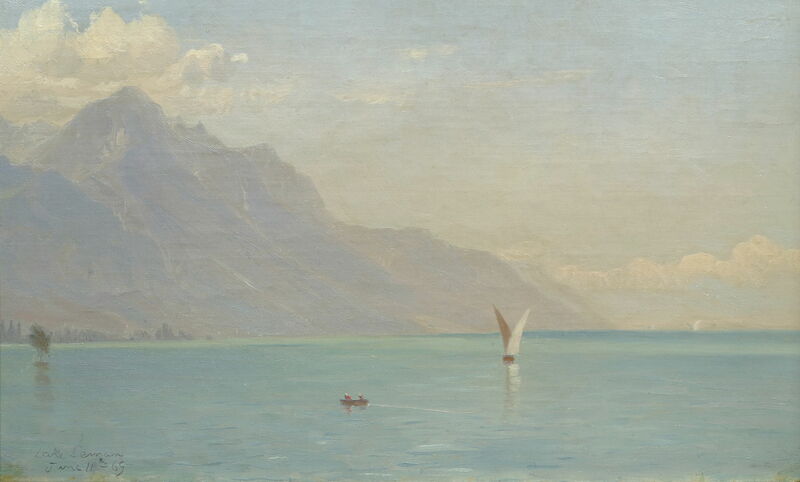 John Ferguson Weir (1841-1926), Lake Leman (Lake Geneva), Switzerland (1869), oil on paper, 20.3 x 33 cm, Private collection. Wikimedia Commons. Despite its finish, his Lake Leman (Lake Geneva), Switzerland (1869) may have been painted en plein air, on 11 June 1869. 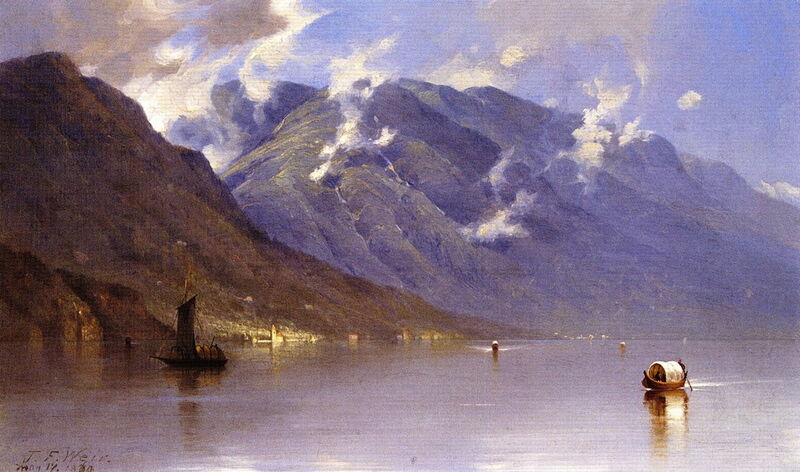 John Ferguson Weir (1841-1926), Cadenabbia on Lake Como (1869), oil on canvas, 22.9 x 38.1 cm, Private collection. The Athenaeum. 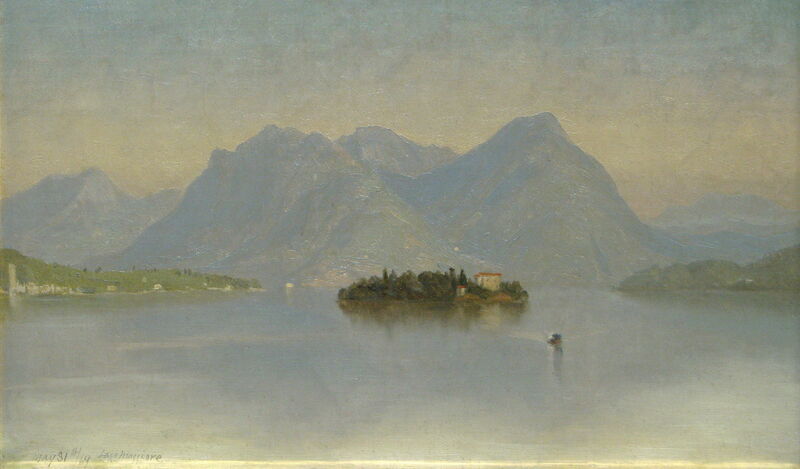 Although his Cadenabbia on Lake Como has been dated to 1869, it is larger, and was almost certainly the result of more prolonged work in the studio. Its dramatic use of light on the town and the hills above is remarkable. John Ferguson Weir (1841-1926), The Grand Canal, Venice (1869), oil on canvas, 121.9 x 91.4 cm, Mattatuck Museum Arts and History Center, Waterbury, CT. The Athenaeum. 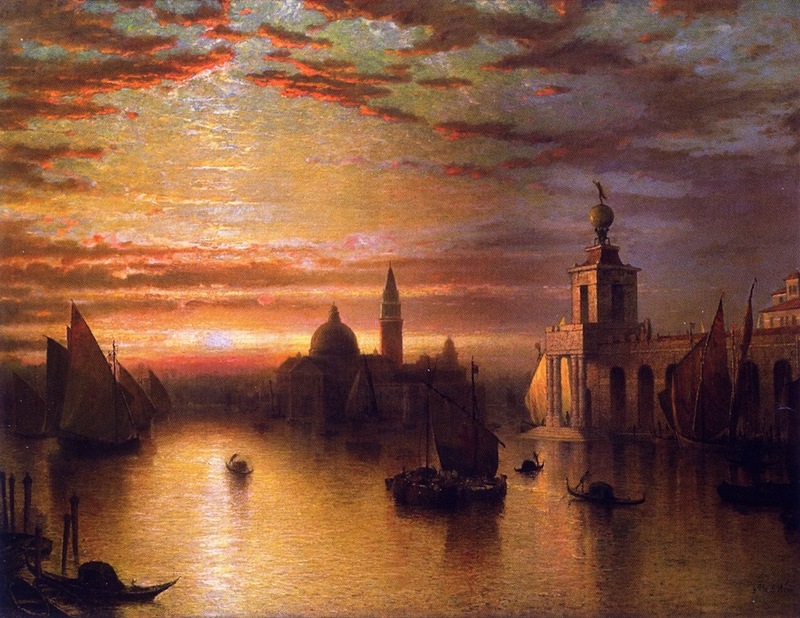 The Grand Canal, Venice (1869) is a much larger canvas which was clearly painted in the studio, probably after his return home to the USA in the autumn of 1869. Weir then started work at the School of Fine Arts at Yale University, where he remained until his retirement in 1913, forty-four years later. With the advice of his younger half-brother, then studying at the École des Beaux-Arts in Paris and becoming steadily more Impressionist, John Ferguson Weir modelled Yale’s programme on European methods. Both brothers were also pioneers in the education of women artists. John Ferguson Weir (1841-1926), Beach at Easthampton (c 1875), oil on canvas, 51.8 × 85.1 cm, Florence Griswold Museum, Old Lyme, CT. Wikimedia Commons. 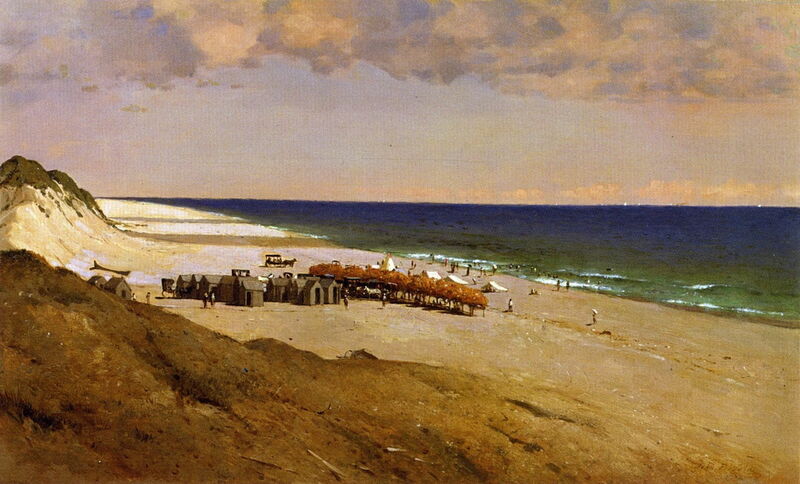 Beach at Easthampton (c 1875) shows this Long Island beach (usually referred to now as East Hampton), with its almost military encampment of huts, shades, and tents. John Ferguson Weir (1841-1926), A Rocky Mountain Peak, Idaho Territory (1882), oil on canvas, 77.5 x 47 cm, location not known. The Athenaeum. 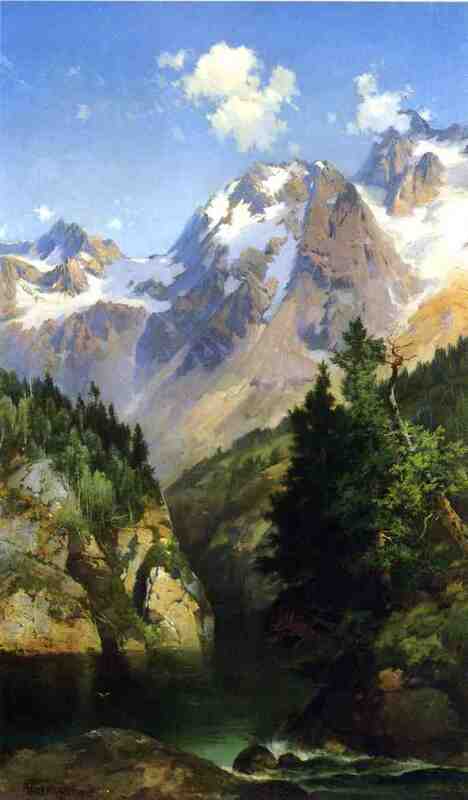 Weir retained his detailed realism until quite late in the 1800s, as shown in his impressive depiction of A Rocky Mountain Peak, Idaho Territory (1882). 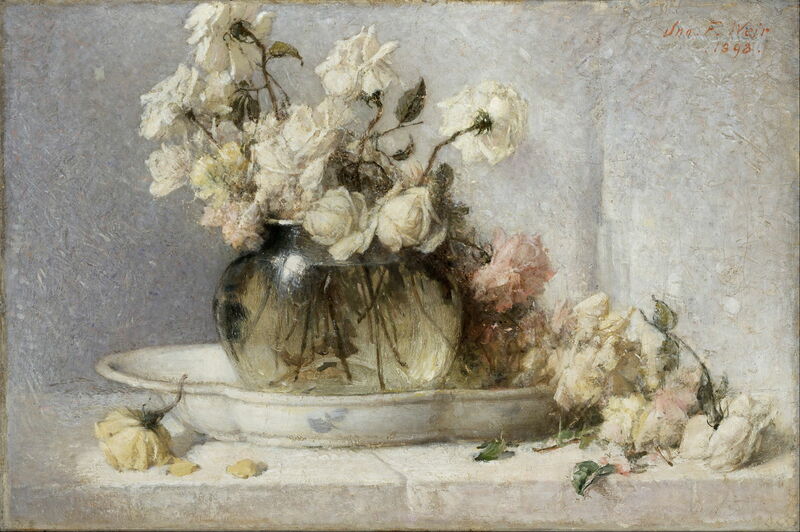 John Ferguson Weir (1841-1926), Roses (1898), oil on canvas, 50.8 x 76.5 cm, Smithsonian American Art Museum, Washington, DC. Wikimedia Commons. However, from the early 1880s, Weir painted several still lifes, including Roses (1898), in which his brushstrokes became increasingly painterly. 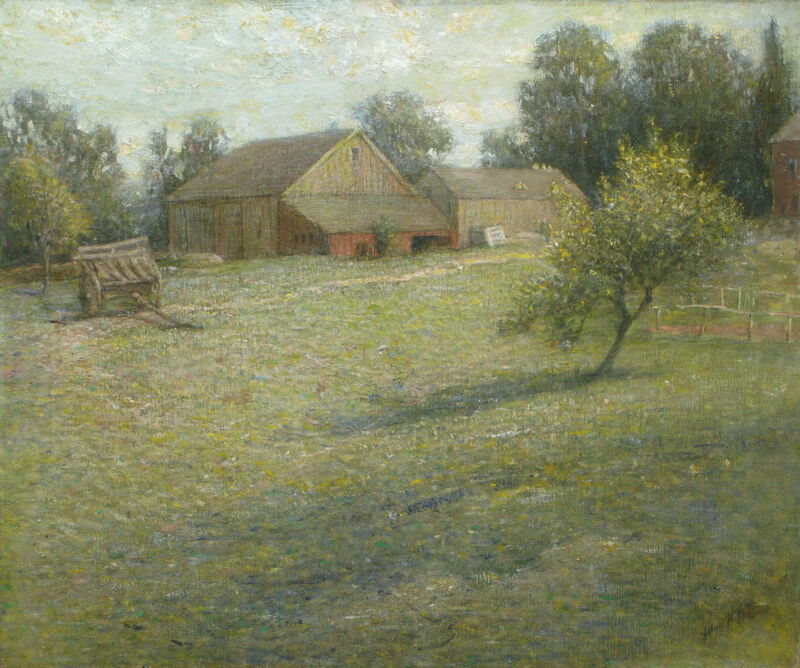 John Ferguson Weir (1841-1926), The Farm, Branchville, Connecticut (date not known), oil on canvas, 50.8 x 61 cm, Private collection. Wikimedia Commons. He also maintained close contact with his half-brother Julian Alden Weir, visiting his farm in Connecticut to paint with him. This led to experiments with more ‘modern’ styles, such as his The Farm, Branchville, Connecticut (around 1890-1900) in which his facture has changed completely. 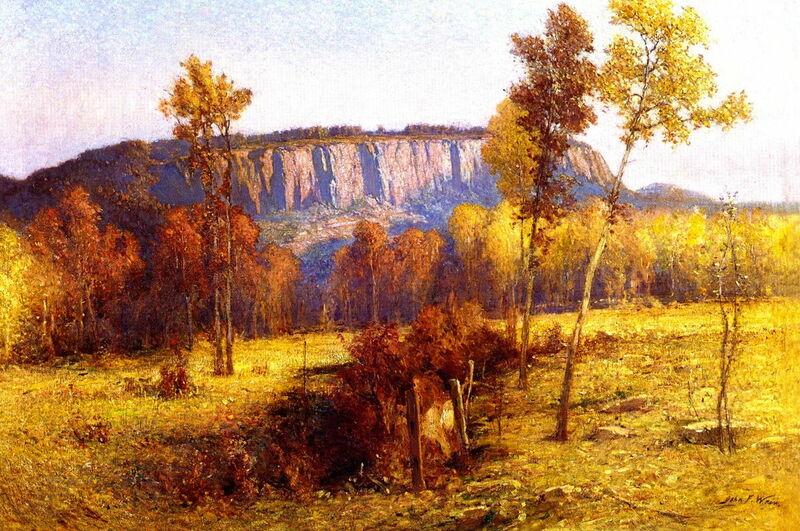 These were followed by an increase in his chroma, as shown in this vibrant painting of East Rock, New Haven (c 1901), which was close to his home and work at Yale. 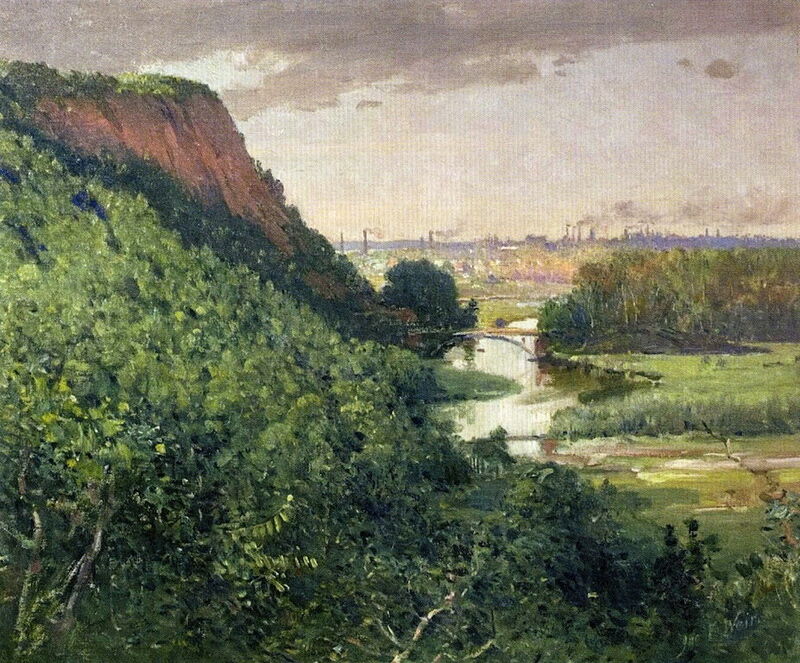 John Ferguson Weir (1841-1926), New Haven from East Rock (1900-1), oil on canvas, 50.2 x 61 cm, New Haven Museum, New Haven, CT. The Athenaeum. New Haven from East Rock (1900-1) shows almost the reversed view, looking down on the smoking chimneys of the town. 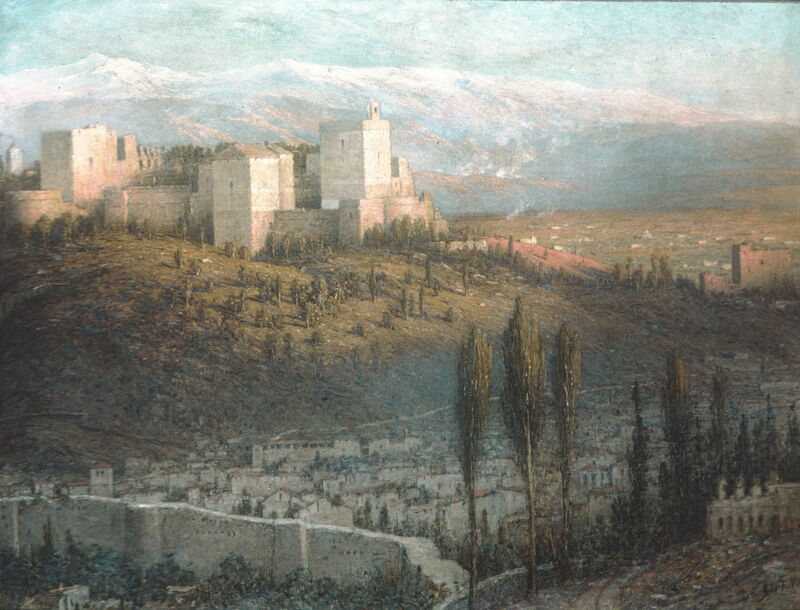 John Ferguson Weir (1841-1926), The Alhambra, Granada, Spain (c 1901), oil on canvas, 92.1 x 118.1 cm, The Metropolitan Museum of Art (Gift of David T. Owsley, 1964), New York, NY. Courtesy of The Metropolitan Museum of Art. Although his teaching was a heavy commitment, Weir still found time to travel, and returned to Europe several times. The Alhambra, Granada, Spain (c 1901) is one of the finest of his late paintings, and shows how far he had travelled from his early works. John Ferguson Weir (1841-1926), Basilica of San Francesco d’Assisi, Italy (1902), oil on canvas, 63.5 x 76.8 cm, Private collection. Wikimedia Commons. 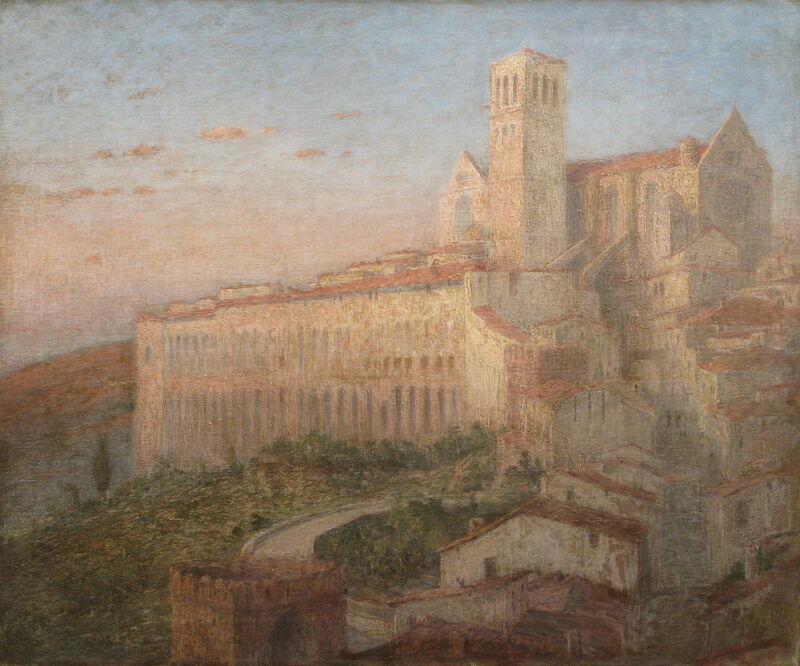 But of all his late paintings, I think his Basilica of San Francesco d’Assisi, Italy (1902) is the most accomplished, and, in his quietly academic way, the most radical in style. John Ferguson Weir (1841-1926), Forest of Fontainebleau (c 1902), oil on canvas, 48.9 x 61 cm, Private collection. The Athenaeum. 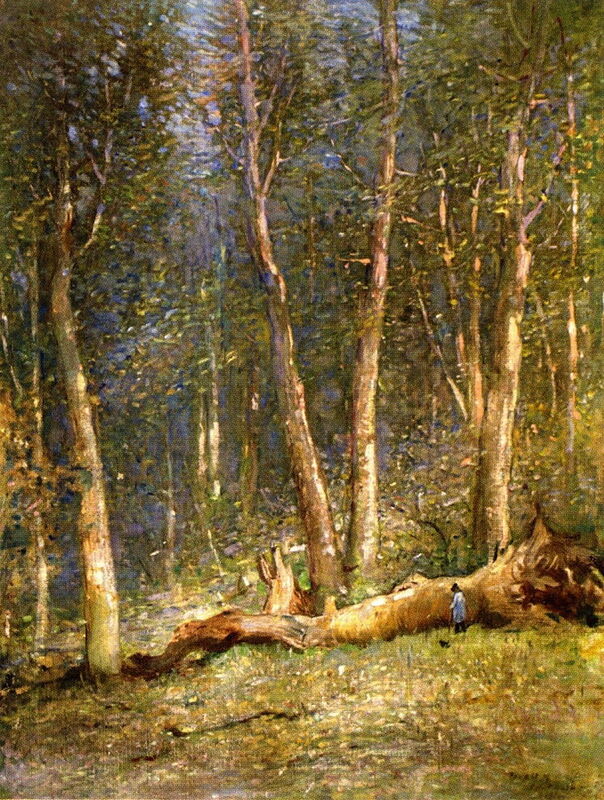 Forest of Fontainebleau (c 1902) shows his versatility in responding to a very different motif, with its tiny and solitary figure against the fallen trunk. On his retirement from Yale in 1913, he and his wife moved to Providence, RI. Although he rented a studio and became involved in local art, his eyesight and health imposed increasing limits. He died in 1926. John Ferguson Weir was much more than Julian’s half-brother, or even the founding father of fine arts at Yale. He was a highly innovative painter, who pioneered the depiction of heavy industry in the US, made an exquisitely beautiful series of works showing scenes in Europe, and developed his style through his long career. He was one of America’s master painters. Posted in General, Painting and tagged Impressionism, painting, Post-impressionism, Weir, Wright, Yale. Bookmark the permalink. These are amazing! I can’t believe I’d never heard of him until now! I was looking for sculpture. Have you heard of Charles Adrian Pillars? He died in 1936 or 1937. My favorite Weir is the Forest of Fontainebleau. Thank you. No, I don’t ignore sculpture, but don’t know enough about it. It is also tough to cover properly on a website, I think: I always want to touch sculpture. It will be a while before we can do that online! I hadn’t heard of Pillars, and he only has a stub on Wikipedia, so can imagine he will be hard to learn about.